2 bedroom/2 bath Star Park Home. Ideally located in the heart of Salt Lake City. 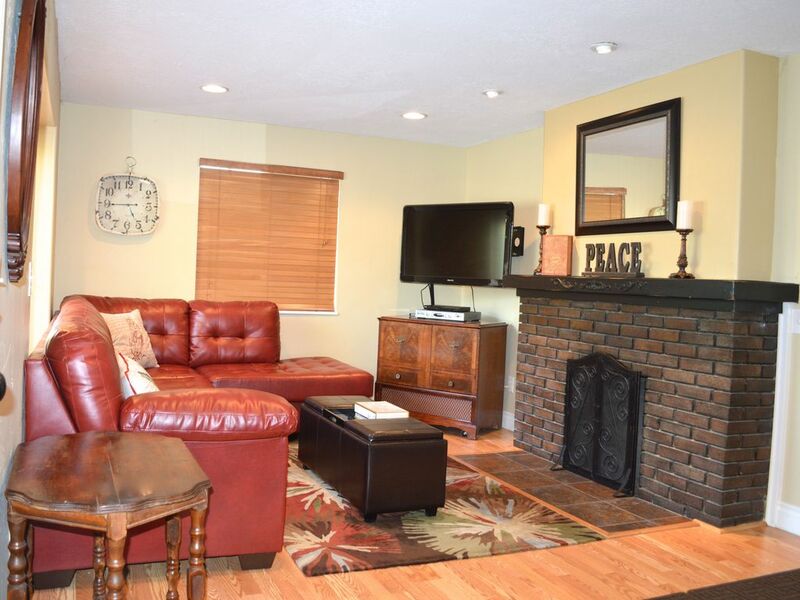 It is a roomy two-story home with vaulted ceilings and plenty of natural sunlight. It features a spacious kitchen with granite countertops, stainless steel appliances, and a dining area that seats up to 12. Walk onto a spacious patio with a large fenced back yard, outdoor gas weber grill, and seating for 6. It’s a perfect getaway for a large family, two small families, or a group of friends powwowing for that needed vacation. My living room boasts a newly purchased sectional couch and HDTV, Comcast cable, Netflix, HBO, DVD player, and Apple TV. Wireless internet is another bonus. The two bedrooms are located on the main floor, each with queen beds and window seats. On the main floor bathroom, relax in the jetted tub. The basement offers a family room with a full bed, twin bed, additional bathroom, and washer and dryer. I delight in providing my guests with every detail needed to make your stay enjoyable, including linens, kitchen utensils, entertainment perks, and more. Be sure to check out the glowing reviews from my former guests who have loved their stay in my home. I think you’ll agree. Home has keyless access codes. I purchased ​this​ ​"​dream home​"​ in the spring of 2010, ​and ​it was perfect and exactly what I wanted​:​ a fully refurbished home with a spacious kitchen and granite countertop​ ​in a mature neighborhood in SLC​.​ My two daughters and I made it our home for over 2 years​ and t​he plan was to live the rest of my life there. Then as it ​often ​goes, I married a​n​ amazing man​,​ and with his three kids and my two we moved into a bigger house. Although ​I was saddened to leave my home, I​'m thrilled to have the opportunity to rent​ it​ to guest​s​ and for them to feel the ​same ​joy this home br​ought me.